The grounds now include a monument called "The Tomb of the Unknown Slave". 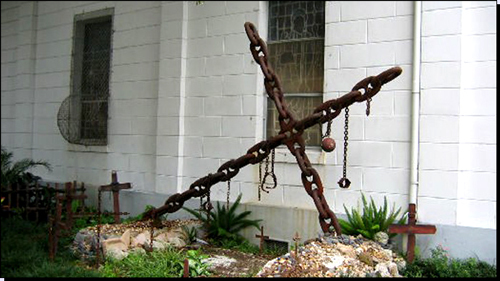 Open shackles and a ball and chain hang from a cross. A rope symbolizing a lynching hangs from a tree limb. Bones of slaves are said to be buried on the premises. Many people consider the church to be the cradle of jazz. 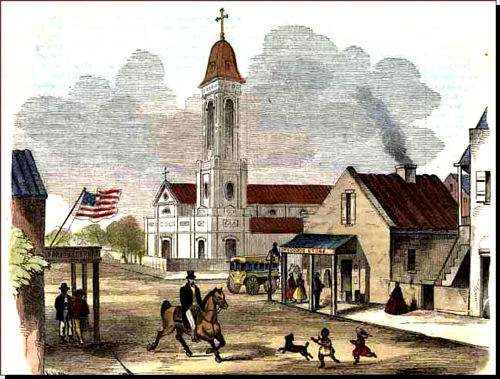 Slaves and free people of color would pray and sing in the church. After Sunday mass they would continue singing and dancing in nearby Congo Square. There they fashioned a sound that would uniquely characterize New Orleans. 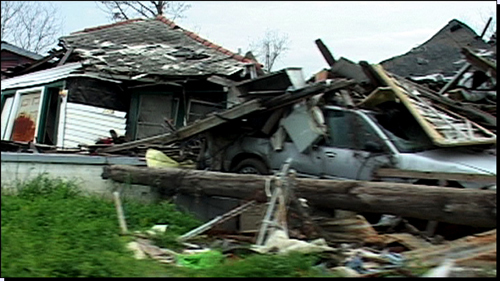 On August 29, 2005, Hurricane Katrina slammed into the southern coast of the United States. It was perhaps the single most devastating natural disaster ever to hit the country. Over a thousand people died and hundreds of thousands were displaced by the storm. Today more than half of the inhabitants of New Orleans - mostly African-Americans - are still in exile with no obvious way home. Father LeDoux stayed in the Tremé neighbourhood for eight days after the hurricane so he could watch over the church and his neighbours, giving them spiritual solace and first aid. Many St. Augustine parishioners lost family members and their homes were destroyed. Though St. Augustine was damaged by the storm, the flood waters hardly reached the sidewalk around the church. It is a very valuable piece of property indeed. Six months after Hurricane Katrina struck New Orleans, Archbishop Alfred Hughes announced that he would close the parish of St. Augustine Church and dismiss its priest, Father Jerome LeDoux. The archdiocese said it could no longer afford to subsidize the church as many of its places of worship were damaged by the hurricane. There are far fewer parishioners now and, according to the archdiocese, the funds are lacking to repair church property. But several other churches were more badly damaged and nevertheless remain open. My footage is used in this film. Hit that St Augustine Church Tag below for the full vids I produced about the church occupation.